What time of year do you fly ? 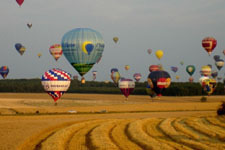 Nearly all balloon flights take place between April to October. During this period we fly as often as possible. When the weather conditions are good we fly early morning or evening. A very limited number of flights may be scheduled outside the main flying season depending on circumstances, and these winter flights may be during the day. However, winter flights can never be guaranteed due to the adverse seasonal weather conditions. As a general rule, for morning flights we normally meet about an hour after sunrise or about two and a half hours before sunset, when the conditions are most favourable for flying. We fly from various different launch sites in the locality depending on the wind speed and direction. We ask you to call our Weather Line to check meeting times and which launch site we will be using. Meeting times vary depending on sunrise and sunset times. You will be given the number of the Weather Line when you book a flight to call prior to the flight to check if weather conditions are good for your flight and at what time the flight will meet. It is important that you are on time because we have a specific weather window when the air is cool and stable and we have sufficient daylight for flight. This is when the weather is most suitable for flying because the air is most stable. During the middle of the day thermic activity (rising pockets of hot air) prevents flying during the summer months. We need winds of less than 10 mph, with relatively stable air and good visibility. We cannot fly in rain or if there is the danger of thunderstorms in the vicinity. If your pilot decides at any time that the weather is not suitable for a great flight, then we won't fly. Occasionally we even get to the stage of having the balloon ready for take-off and the weather changes to the point where we cannot fly. If your flight does not happen because of the weather you simply rebook another date. 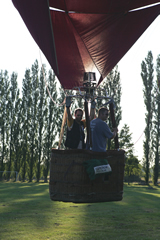 A balloon ride with us is a sensational experience and the wait for an excellent day is always worth your while. We fly many individual passengers, and we are delighted to welcome singles. If you wish to fly on your own you will be made to feel very welcome by the group! 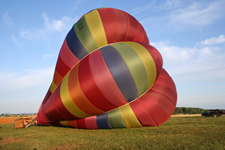 Ballooning is something that can be thoroughly enjoyed by the individual. Why not bring a friend to watch? 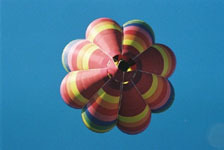 Flights are deliberately informal and passengers are invited to take part in preparing the balloon for flight and packing it away afterwards. Statistically, hot air ballooning is extremely safe. We fly in gentle conditions and our equipment and training is of a very high quality. 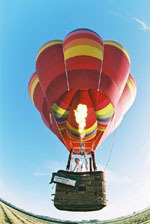 A commercial passenger flight with a hot air balloon operator is viewed by the Civil Aviation Authority as similar to a commercial passenger flight with an airline. We follow strict regulations on equipment checks, training, safety, insurance and licencing, in exactly the same way as any other airline. All of our pilots hold full UK commercial pilots licences. Our balloons have been built by respected and highly qualified technicians working at the world’s best known balloon manufacturing companies. We follow a rigorous maintenance schedule to ensure that our equipment is meticulously looked after. Our baskets are designed for your safety and comfort. For obvious reasons, passengers should ensure that they are in good health and if in doubt should seek the advice of their doctor. Pregnant women should not fly in a balloon. Please be aware that in higher wind conditions the basket can sometimes tip onto its side on landing – entirely normal, and good fun! There are lots of handles to hold on to ! Yes, all of our pilots are certified by the British Government’s Civil Aviation Authority to the level of UK Commercial Balloon Pilot. The CAA’s requirements for Commercial Balloon Pilots are arguably the most rigorous in the world. We fly generally between tree-top level and 2500 feet depending on weather, terrain, and the direction and speed of the wind. That depends on the wind! Since we aim to fly for about one hour, if the wind is 4mph we’ll fly about 4 miles. If it is 8mph we’ll fly about 8 miles, and so on. The actual flight normally takes about one hour, although the pilot will determine the precise length of the flight once airborne based on weather conditions and the availability of safe and accessible landing sites. The entire experience from gathering at the start point to the end of the adventure normally takes between three and four hours, and includes the inflation of the balloon, the balloon flight, the packing up of the balloon on the landing field, a champagne toast, and the journey back to the start point. Because we only fly up to about 2500 feet, there is no significant difference to the temperature on the ground. The burner does give off some heat, so it is a good idea to bring a hat. Wear what you would normally wear for a walk in the country. Bring sturdy flat shoes, wear layers for extra flexibility, and remember that if flying in the morning it can be slightly wet underfoot just after dawn. Try to wear natural materials, and a hat may be useful, particularly for ladies with longer hair, or those thinning slightly on top! Please do not wear valuable clothing – we will be out in nature. We would ask our female passengers not to wear high heels. Due to limited space in the basket, large camera bags, backpacks or other paraphernalia is best left in the retrieve vehicle, and due to the careful weighting of a balloon, heavy hand baggage cannot be carried. Should we bring cameras ? Definitely ! 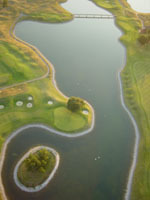 You can take some fantastic pictures and footage from the basket with a video or digital camera. But make sure your batteries are well charged and you have plenty of space on the storage for the many images you will take. Please note that we cannot be held responsible for any loss or damage to personal belongings, and you bring them entirely at you own risk. You should stow valuable equipment safely away before landing. View the balloon photo galleries. 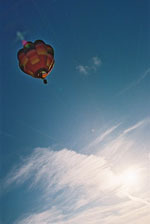 A skilled pilot can steer a balloon to a certain extent, using different wind speeds and directions at different altitudes. See balloon design) At the start of our flight we will know the direction of the flight, but not the exact landing spot – which is the magic and mystery of a balloon flight ! We are never entirely sure, and this is part of the mystique of ballooning. It really is a magical mystery tour! Before the flight we will know the direction of the flight, but not the exact landing spot. We usually try to land in a suitable grass field. In the past we have landed in large gardens, on the outfield of cricket pitches, and in parks. We meet up roughly an hour after sunrise or two and a half hours before sunset. Under the expert eyes of your captain, we will assemble the balloon on the launch field, whilst answering any questions you may have about the kit we use or the flight itself. After a detailed briefing from your pilot you will be asked to board the balloon, where you will have time to make yourself comfortable. Your highly experienced pilot will heat the balloon until it becomes buoyant, and you will gently lift off. You will feel the ground slowly falling away from you – a completely unique experience. We will then fly over our flight area for roughly an hour travelling at different heights depending on the wind speed and direction. We aim to fly at treetop level up to about 2500 feet to offer you the widest experience during your flight. On landing your pilot will debrief you about the flight, the balloon will be packed away and stowed in the trailer, and then there will be ample opportunity to chat with the pilot and crew whilst flight certificates are being signed, and the flight is being toasted with a bottle of finest champagne! 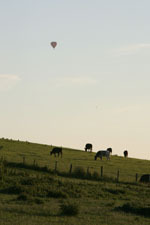 However, words cannot really describe the wonder of a balloon flight – much better to come and see for yourself. We’d love to see you in our basket this summer! Or why not take our simulated flight, which will give you a taste of what to expect? The balloons are roughly the height of a 5-storey building, but pack away in to a surprisingly small bag – many of our passengers are amazed about how tiny the “stuff bag” is ! We fly different sizes of balloons. Passengers taking our exclusive VIP flights will fly in a small balloon with only 2 passengers and a pilot. This is the ultimate ballooning experience. Passengers flying in our larger balloons will take an amazing walk amongst the clouds with 7 to 16 other passengers depending on the balloon size used on the day. Our retrieve crew will follow the flight of the balloon on the ground in a vehicle pulling a balloon trailer. On landing we will pack the balloon up into the trailer, and we will return you to our start point. Yes, all flights should be booked in advance. 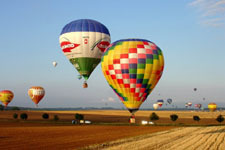 Please buy balloon flight vouchers on line. Alternatively, call us on 01844 212998 with your credit or debit card details and we will send your flight voucher by return of post. You must be agile enough to climb in and out of the basket, stand for the duration of the flight, and be prepared for a possible bump and drag on landing! If you are in any doubt you should consult your GP, and you should advise us of any medical issues including any knee, leg, hip or back problems. We also need to know of any recent medical treatments, frailty, or any physical condition which could affect your safety during flight. Pregnant women should not fly. Children must be 8 years or older, should be tall enough to see over the edge of the basket (1.2 metres), and should be accompanied by a responsible adult if less than 16 years old. It is very important that you give us accurate weights for all passengers flying under your booking because balloons are very carefully weight-loaded. Yes, absolutely. They are more than welcome to help with the setting up of the balloon and then watch the take-off. Please note that friends following the balloon do so at their own risk. If large numbers of spectators are expected we would encourage them to minimise the number of cars. We would recommend bringing a picnic or retiring to the local hostelry – nominating a designated driver, of course - to await the return of the balloon passengers ! Yes, we offer VIP flights where it is possible to book one of our smaller balloons for the exclusive use of 2 passengers. VIP flights are popular for those very special romantic occasions such as proposals, weddings or anniversaries. Can I give a flight voucher as a gift ? Yes, Flight Vouchers are ideal for birthdays, Christmas, anniversaries, treats, weddings, and any other special occasion. It is truly a gift that the recipient will never forget. Just contact us with the name and details of the passenger(s) and we will do the rest! When you book a voucher with us we will send it to you by return of post. Or you can book on line and receive your vouchers by post or in seconds by e-mail. Click here to book a Flight Voucher. The Flight Voucher is valid for 12 calendar months from the date of purchase. We will extend the validity of your Voucher for a further 12 months if you have tried to fly at least 5 times during the initial 12 month period, and on each occasion you flight has been cancelled by us. Cancellations by you do not count as attempts to fly. Please note that winter flights are infrequent, and flights should be taken during the summer to ensure your fulfilment of these conditions. See our full terms and conditions here. Early French balloonists carried fine champagne as a gift to local citizens who thought the huge, smoking objects descending from the sky must surely be demons and set out after them with pitchforks and other hostile implements. The pilot would lower the bottle to the worried crowds below in exchange for being allowed to land. Because of this ballooning became known as the “champagne sport”, and we continue this tradition by drinking a champagne toast to new found friends on our safe return to mother earth. Read more about the history of ballooning. There is ample evidence to suggest that flying in a balloon usually does not worry passengers who are uncomfortable with heights. Because we leave the ground so gradually and gently, passengers are often 1000 feet up and comfortable before they realize they have left the ground. Many passengers with a fear of heights feel a sense of accomplishment and say they would do it again. It is a completely different sensation to looking off the edge of a building or climbing up a ladder. However – don’t be press-ganged into flying if you really don’t want to !